What is about Disney’s “The Lion King,” that makes it so special? For starters, it remains one of the most inventive retellings of a Disney cartoon anywhere. Original director Julie Taymor’s magnificent color palette of a mind has aged extremely well, still thrilling audiences since its original stage debut in 1997, based on the 1994 animated feature. Furthermore, the music of Elton John and Tim Rice continues to soar. The most recent stop on the tour, the San Jose Center for Performing Arts via Broadway San Jose, is really just as delicious as it has ever been. Now I have seen this production at various times over the years, and have had a plethora of reactions. The first time I saw it back in 2001, it was played in the New Amsterdam Theatre, where the row of seats in front of you acted as hard wooden pillows for your helpless knees. Yet, the show was thrilling nonetheless. Other times over the years, even though the new car smell wore off, the show has still been joyous, breathtaking even, but this most recent production is truly a cut above. Maybe it was that I was able to experience with my 11 and nine-year-old daughters, who were a bit confused at moments with the exposition, but still loved the constant fourth-wall breaking and boundless energy, with beautiful and energetic dance numbers featuring a plethora of exquisite, African rhythms. They were also certainly thrilled at the wonderful spectacle that is a delicious blend of classical Greek mask work and Shakespearean storytelling. My oldest daughter certainly fell in love quickly, declaring that love in a gleeful whisper to me after the most beautifully breathtaking opening number, “The Circle of Life,” a number that never fails to chill me. There are certainly plenty of moving and joyous performances amongst the talented cast. The Shaman-like mandrill Rafiki (Mukelisiwe Goba) provides a beautiful insight into the hierarchy of the Pride Lands, sharing wisdom and playfulness with the audience. Patrick R. Brown’s take on Scar is full of snark and sarcasm, which works well for this vindictive, Claudius-like villain. And Gerald Ramsey’s Mufasa carries a regal, authoritarian presence, a man who deeply loves his son, preparing him for the day when he alone must carry the burden of being the king. 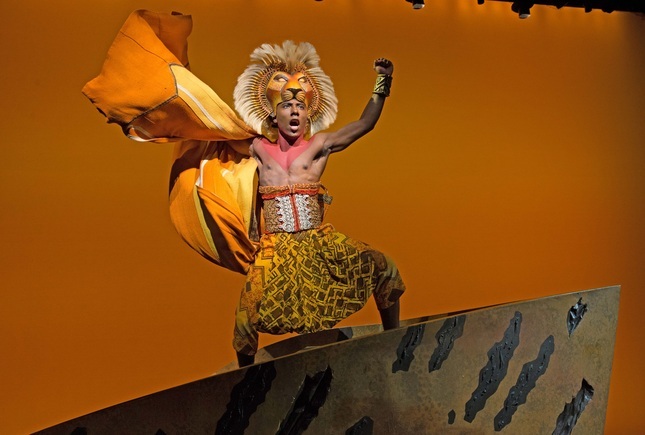 And certainly, Aaron Nelson handles the act two portrayal of Simba with conflicted pain. He is assisted beautifully by childhood friend and love interest Nala (Nia Holloway). Humanistic Red-Billed Hornbill Zazu (Drew Hirshfield), provides plenty of comic relief, along with goofy sidekicks Timon (Nick Cordileone) and gassy warthog Pumbaa (Ben Lipitz) and all their cartoonish antics. What captured me most about the play during this go around is the way it makes you feel. It is just a beautiful blend of pathos and joy. For starters, notice the power when the lionesses mourn the death of Mufasa. The pain that comes when those lionesses drop tears out of their eyes is stunning. The beautiful movements of the body that informs those same masks are loaded with fluidity, the pain being felt throughout the performer’s core, which translates to an adoring audience. Julie Taymor’s staging has undergone a bit of a trim since that original 1997 production. Personally, I loved the extra orchestration in “Can You Feel the Love Tonight,” which now only exists on the soundtrack. Taymor’s handprints and reverence for many theatrical forms are all over the show. From Greeks and their visceral use of masks to dazzling shadow and conventional puppetry helps tell the story on the stage with zeal and reverence. Taymor’s vision is brilliant and bright in moments, yet Scar’s world brings about drabs and darks. Despite a certain darkness that exists in many moments, the power and appeal of the play is its joy. A beautiful cast bellows with giddiness, boundless energy that not only performs on the stage but all over the theatre. One thing about “The Lion King” is that it has proven to be like a fine wine, getting better and sweeter with age. Equal parts Greek tragedy, Greek morality play, Hamlet and slapstick comedy makes for a musical that is loaded with heart and pride. There is no doubt that I certainly felt the love that night.